ISLAMABAD: The Supreme Court of Pakistan on Monday rejected appeal filed by the National Accountability Bureau against the order of the Islamabad High Court allowing the Sharif family’s pleas seeking suspension of their sentences in the Avenfield reference instead of hearing first their criminal appeals. The anti-graft body, through its chairman, had filed a petition on Saturday in the apex court for leave to appeal under Article 185(3) of the Constitution against the order passed by IHC on September 10, 2018. 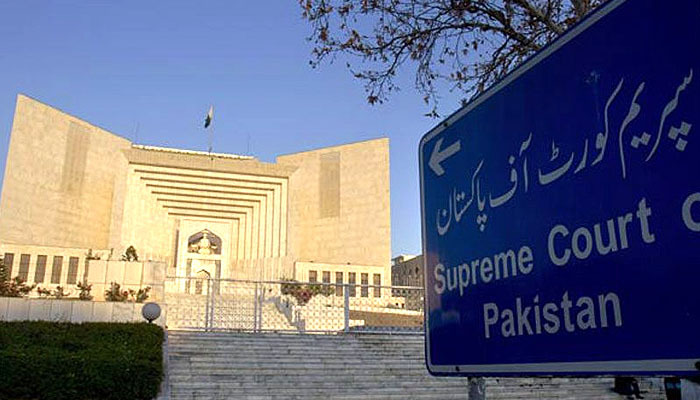 A SC bench headed by Chief Justice Pakistan Mian Saqib Nisar heard the appeal and fined the NAB for taking frivolous matters to the apex court. NAB prayed to the SC to grant leave to appeal against the order passed by the learned high court on September 10 and the same may be set aside and the learned Appellate Court may be directed to take up the appeals first. On July 6, accountability court judge Mohammad Bashir had sentenced Nawaz Sharif, his daughter Maryam Nawaz and son-in-law Captain (R) Safdar to 10 years, seven years and one year, respectively, in prison due to the Avenfield properties case. The judgment disqualified Maryam Nawaz and Captain (retd) Safdar from contesting elections for 10 years each. The sentence and a fine of eight million pounds or $10.6 million came almost a year after the Supreme Court removed Sharif from office and less than five months after the court barred him from holding office for life. Nawaz Sharif, his daughter Maryam Nawaz and son-in-law Captain (R) Mohammad Safdar had assailed the judgement of July 6 in the Islamabad High Court through appeals. Meanwhile, the convicted Sharif family filed writ petitions for suspension of sentences passed in the judgement dated July 6, 2018. The Division Bench of the Islamabad High Court passed an order dated August 20, 2018, for fixation of main appeals which were eventually fixed for arguments on September 10, 2018. NAB contended that now the convict respondent (Mian Nawaz Sharif) has filed a CML under Section 561-A CrPC for fixation of writ petition seeking suspension of sentence instead and for postponement of criminal appeal. NAB submitted that the said CML was fixed for preliminary arguments on September 10, 2018, but the learned division bench of Islamabad High Court entertained the same and without even issuing notice to the state, pass an order dated September 10, 2018, through which the learned court reviewed its earlier order dated August 20, 2018, postponed the proceedings in the criminal appeal and fixed the write petitions immediately for the next that day i-e September 11, 2018. The anti-graft body contended that a criminal application under 561-A CrPC cannot be filed in a writ petitions which are necessarily civil proceedings. “It is not just and reasonable to pass an order in the aforesaid application without issuing any notice to the state, and it is unfair to pass an order in the said application without allowing the state to file a written reply and without even going through the relevant record,” NAB contended. The Bureau submitted that Division Bench of the IHC cannot review its earlier decision while exercising its jurisdiction in application under Section 561-A CrPC. It further contended that respondent Mian Nawaz Sharif has not provided any cogent reasons for seeking the relief. The anti-graft body submitted that it was just and proper for the convicts respondents to engage the services of some other counsel if their actual counsel had shown his disability to appear before the Islamabad High Court. NAB prayed to the apex court to grant leave to appeal against the order passed by the Islamabad High Court on September 10 and the same may be set aside and the learned Appellate Court may be directed to take up first, criminal appeals filed by the convicts.